‘You’re sure this is the place?’ Jack was glued to the map, a three dimensional representation of a volume of space three hundred parsecs cubed. It contained thousands of stars of which just one was highlighted in an ugly plastic pink that reminded him of those habitats where people deliberately had themselves altered to look like children’s toys in adult bodies. Arijit nodded and flicked the map so that it spun around and zoomed in. It blurred the stars in such a way as to make some observers nauseous; a sensation he loved. Most weeks he was stuck in the engine room of the Buy High, an inappropriately named beta class trading ship in which he had a 1/33 share, so any sense of movement he obtained from sliding on over to visit Jack in astronavigation and playing with the galactic map was a chance not to be missed. Arijit, (or Bobby to his friends who didn’t trace their origin to the Indian Democratic Commonwealth and had trouble with his name), dreamed of the big time, of owning his own ship and answering to no one but himself. Their destination, the third gas giant of a small G5 class star in the heart of the volume they were looking at, represented the beginning of Bobby’s plan. Which included Jack of course, who’d persuaded the captain, a brunette called Ding whose body didn’t fit her flight suit in just the right way in all the right places. It wasn’t that Bobby didn’t care whether Jack got his share of their endeavours; it was more that Bobby had been working the angles for as long as he could remember. Unfortunately, apart from the occasional small score, others had always seemed to benefit from his ideas more than he did, a turn of events which was something of a disappointment to him, especially in those years when he chanced to visit his parents, aging and successful medics in New Bombay, who always felt it was an important part of his education to be compared to his more financially successful brother Lal. ‘The market is definitely gathering there then?’ Jack didn’t sound convinced. Besides, Bobby thought, you should have worried about that before you helped me convince Ding. The captain, in the end, had been less of a bear than they’d anticipated. She and Jack got on well, taking the chance to flirt harmlessly whenever they could as a way of brightening up the dull hours of schlepping low profit goods from one Great Power to another. Ding had 3 shares of the ship, more than anyone else, but still a small enough holding for the rest of the 30 crew to feel they were getting a fair slice of their measly profits. Of course, she’d insisted the crew share in the profit of Bobby’s idea. He had deflated inside; it was yet another go around where he’d have to give up the profits to others whose only contribution had been to take him somewhere so he could do his thing. On the other hand, without them he knew he’d end up working as an engineer on small ships for the rest of his life. There was no way he’d ever be rich enough to afford his own clone and he desperately wanted to live forever. Jack, by contrast, was content with living once in the real world and then surviving as a disembodied consciousness in the ‘net and this to Bobby summed up his friend’s small-hearted lack of ambition perfectly. Ding had looked over Bobby’s evidence – half intercepted reports, mathematical models showing efficient routes through spatial volumes for the ships he’d been tracking, as well as news reports supporting the trajectories of the ships he claimed were part of the Troll Market. The Troll Market was a coming together of the Trollish clan, a disparate and disagreeable tribe of people from across the Great Powers who considered their identities to be tied more closely to others in the clan than to any sense of geographical origin. Trolls were widely characterised as somewhere between traders and anarchists, but Bobby reckoned they were simply ahead of the curve. The clan was united in its view that planets weren’t for living on, instead they lived on board their ships, the backbone of their fleet being a collection of large civilian ships refit for long term living among the stars. Trollish were said to be the furthest travelled sector of humanity and rumours about what had been found and why they had abandoned life on the ground orbited like an asteroid belt. Every now and then a chunk would become dislodged, burning up as it approached the blazing sun of scrutiny, but there were always more tidbits of information reserving the Trollish a special place in the public’s imagination. Their gatherings were private, unpublicised and always occurred in systems without jumpgates. ‘Funny.’ Bobby would not be discouraged. The Buy High arrived in the system and the whole crew was stunned. There were thousands of ships and dozens of habitats. As they flew in, the comms channels erupted into complete chaos as the clan zipped around the system with an utter lack of composure. ‘Trust me,’ said Bobby hopefully, he knew he was good at negotiating, he’d just never found the right things to debate over. Ding was good to her word and let Bobby and Jack take the tiny little ship to ship shuttle they owned over to one of the habitats. They took fresh milk, cryogenically stored for the entire year since they’d picked it up in Epsilon Eridani, cheese, fudge, a kilo of Camooran Caviar from a good vintage and three crates of port from Porto on old Earth. ‘I could buy an entire ship for that port.’ Bobby had found it in a forgotten manifest of a ship that had been mothballed after its owner died along with his company. Jack was unconvinced of the port’s authenticity, but it was still sealed and, at least at first glance, appeared passably credible. Bobby never wavered under their disbelief, ‘wait and see,’ was his final word on the matter whenever they teased him. ‘I get 3 shares in it to everyone else’s 1?’ He didn’t look like he believed her. ‘It’s your company.’ Ding had helped him file the registration papers with the nearest power, the Universal Caliphate, and ensured that if he made a profit then funds would be automatically used to on-register his enterprise among all the other Players. ‘It never occurred to me,’ he marvelled to Jack. ‘That’s why you’re an engineer and she’s a captain,’ said Jack. As well as the luxuries, Bobby had, on Jack’s advice, found some emeralds on a station run by an old soak called Tan. He hadn’t asked where they’d come from, but the Trollish would want them for their use in astrometrics. ‘Who’d worry about the details then?’ asked his friend and Bobby had the good grace to shrug. Jack and Bobby docked on the habitat and, after much deliberation, sold their goods, fleeing from one auction as the participants came to blows over the emeralds. 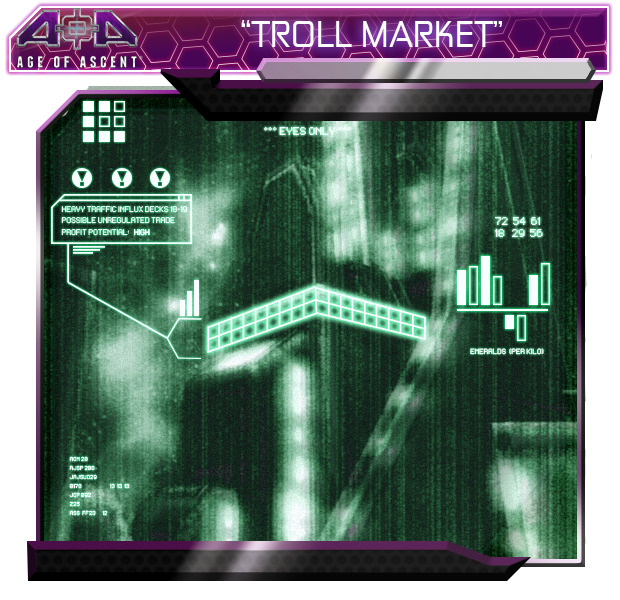 The Trollish were only willing to pay in their own crypto-currency, but Bobby had it right; everyone in the Troll Market would accept it and they had an entire day to taste, prod and test possible items to take home with them. In the end the decision was simple. The Trollish had researched plants and even some animals that prospered under artificial gravity and sunlight from foreign stars. They’d achieved results even the larger colonies would be desperate to understand. Jack didn’t believe they would sell, but Bobby’s smile and his ever-present optimism persuaded the Trollish vendors to part with enough samples that they felt like kings when they returned to the Buy High. Ding took the ship out of the system even as the Troll Market truly got into full swing. By the time the clan disbanded for another year the Buy High was half way back home and Bobby was three thirty seconds worth of quite, quite rich.